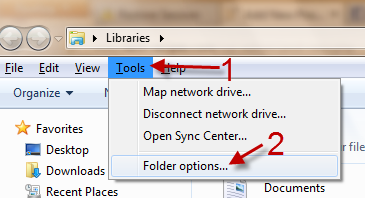 By default, Windows 7 can display thumbnails for supported files to help you find your files quicker. Although this feature is helpful, it can also display your sensitive files to others. 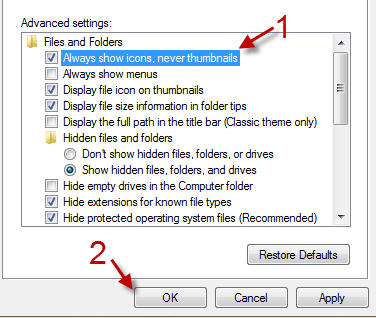 If you do not wish that to be the case, you can follow this tutorial to completely disable file thumbnails, and make all files display as icons only. 1. Open Windows Explorer by pressing Win key + E or simply clicking on the Computer icon on your Desktop. 2. If the Explorer’s menu bar is hidden, press Alt to show it. 4. While you are in the Folder Options window, switch to the View tab. 5. Check the box next to the Always show icons, never thumbnails option. 6. Hit OK to save the setting.